Ukrainian warships have passed under the Kerch Strait Bridge and are now heading for the Sea of Azov, a source in Ukraine’s law enforcement agencies. "Ships of the Ukrainian Naval Forces have sailed under the arch of the Crimean Bridge and are headin for the Sea of Azov," the source said. 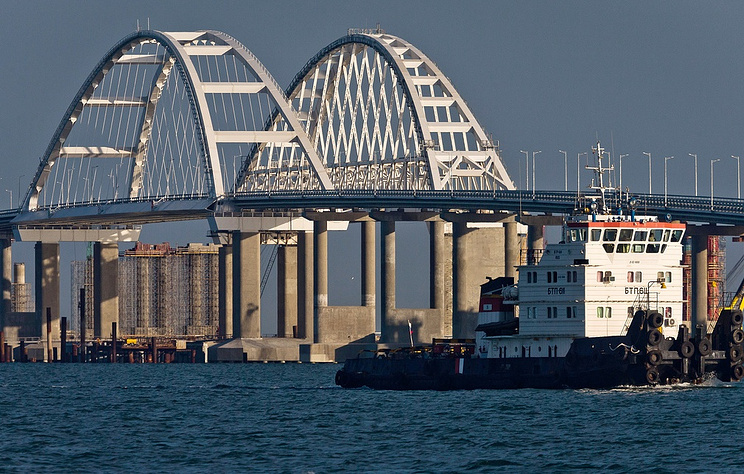 Director General of the Crimean Sea Ports state company, Alexei Volkov, confirmed reports about the passage of Ukrainian warships under the Crimean Bridge. "A Ukrainian ‘squadron’ entered the channel at 13:50 Moscow time and passed under the bridge at 15:15 Moscow time," he wrote on his Facebook account. According to earlier reports, two ships of the Ukrainian naval forces - the Donbass command ship and the Korets tugboat - on Saturday entered Russia’s exclusive economic zone off the Crimean coast. The ships are escorted by Russian coastal guard ships. The Crimean border department of the Russian Federal Security Service was unavailable for comment.